Nearly 60 per cent of survivors accessing domestic abuse support services have children and 1 in 15 are pregnant, according to a new report released by Women’s Aid to coincide with Mother’s Day, which this year was on 31 March. And according to the report, The Domestic Abuse Report 2019: The Annual Audit, domestic abuse services are struggling to cope with demand and provide the level of support that survivors and their children need because of ongoing funding uncertainty and budget cuts. In data taken from 49 domestic abuse organisations in England using On Track, Women’s Aid’s case management system, 58 per cent of the 18,895 women supported by these services during 2017/18 had children and 1,253 women were pregnant. Yet nearly one in ten refuges and one in five community-based services who responded to Women’s Aid’s annual survey said that they received no local authority funding in 2017/18. This ongoing funding crisis has meant that over half of responding organisations were running an area of their domestic abuse service without any dedicated funding and just under a third of services have had to reduce the amount of support they are able to provide to each survivor and her children, since 2014, due to funding issues. Despite a welcome uplift in the number of children and young people services in the last year, from 190 in May 2017 to 197 in May 2018, there has been a 17 per cent fall in the number of dedicated children and young people services in England since 2010. 16 per cent (22) of the organisations who responded to Women’s Aid’s annual survey were running children and young people services without any guaranteed form of funding in 2017/18 – this was 13 per cent (16) of responding organisations in 2016/17. Survivors fleeing domestic abuse with their children also face challenges in finding a space that can accommodate their family; the report found that just under half of refuge vacancies could accommodate a woman with two children, while less than one in five could accommodate a woman with three children due to the size of the rooms available. Previously released statistics from the report revealed that an estimated 21,084 referrals to all refuge services in England were declined in 2017/18, averaging over 400 referrals declined each week. Over one in six referrals to refuge (17 per cent) were declined due to a lack of space or capacity to support the survivor. Amna Abdullatif, Children and Young People’s Officer at Women’s Aid, said: “Far too often we hear of mothers being threatened that her children will be removed from her care because of the abuse the family is experiencing at home. This is not the answer. It only puts the survivor and her children at further risk. “Domestic abuse often starts or even escalates during pregnancy – while the majority survivors trying to escape their abusive partner will be fleeing with children. “We at Women’s Aid know that the best way to support children who are experiencing domestic abuse is by supporting both the mother and her children. We want to shift the focus back onto supporting mothers to help families escape domestic abuse this Mother’s Day. “Domestic abuse services provide a vital lifeline to mothers and their children who are living in fear and experiencing abuse. “However, these life-saving services are facing funding uncertainties and budget squeezes which means they are unable to meet demand and have been forced to reduce the amount of support they can provide to families. “No woman and her children should be turned away from the support they desperately need because the service does not have the space or capacity to support them. “No woman and her children should be forced to face domestic abuse alone. “That’s why this Mother’s Day we want to continue working with the government to find a long-term and sustainable funding solution with national oversight for all domestic abuse services. The Domestic Abuse Report 2019: The Annual Audit examines the work of domestic abuse services in 2017–18, including changes in the provision of services in England, information about the survivors these services have supported, the work services are proud of and the challenges they have faced. To read the full report, click here. Also available in the Domestic Abuse Report 2019 is the thematic report, The Economics of Abuse. Economic abuse is often misunderstood but it is a key tactic used by perpetrators of domestic abuse to control their partner and stop her from leaving. 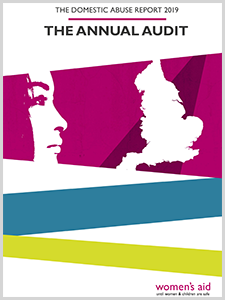 The Domestic Abuse Report 2019: The Economics of Abuse explores the relationship between domestic abuse and economic resources, looking at the needs and experiences of survivors around finances, welfare, housing and employment (economic needs), and how these needs are met by specialist domestic abuse services. If you are worried that your partner, or that of a friend or family member, is controlling and abusive, you can contact the Freephone 24-hour National Domestic Violence Helpline on 0808 2000 247 or visit www.womensaid.org.uk.